Easter, flashbacks and my cardboard testimony. Last weekend, Easter weekend was really powerful. Really really powerful. Ive never experienced an Easter quite like it, in terms of reflecting on the whole story of Christ. Of Jesus dying on a bit of wood. Of the in-between time of confusion and mourning, and then the celebration of the fact that He rose again, and is still alive. It was immense. And I was struck by several things – things that I need to process more, need to think about more, need to explore more and will eventually attempt to write about more. The first thing was about the ‘in-between’ time. The time after Jesus died, and before He rose again. And how that must have felt for the people who followed Him. Who loved Him. Who wept at His feet as He cried out in pain. I can’t imagine how it must have felt for them to have no hope – not knowing that He would rise a few days later, and even if they had known, did they really believe He would? For the miracle maker himself was dead. D E A D. What did having no hope mean and feel to them then. And what does having ‘no hope’ mean and feel now to people who have absolutely no hope. And I remembered the months and years I’ve lived before without hope. Not ever knowing or believing that it could change. The second thing, was on Easter Day – where, as Christians we celebrate the fact that Jesus didn’t stay dead. That He rose again. And it was an amazing service to be in – especially having journeyed from Good Friday through to the Sunday. As part of the talk that morning we watched something on screen. I found it quite difficult at times actually. Because it showed short clips of Jesus going to the cross. Being whipped. And several times I found myself flinching. Because this year it is so much more personal. Has been so much more personal to me. And as someone severely physically abused as a teenager by my drug addicted brother, every time I watched on the screen I couldn’t help but react. Knowing the pain. The agony. The torture. But then as the story continued, and followed through, and we saw Jesus, having died, rise again I was totally overwhelmed and consumed by the wounds. His wounds. The wounds on his body, but more importantly the ones in His hands. The wounds where the nails were driven in. For the first time in my life I noticed/realised/thought about the fact that when Jesus rose, and He showed himself to the disciples that He also showed them His wounds. Not once, but twice. The scars of Good Friday are present on Easter Sunday and beyond. Why? Surely He could have come back without scars, to show a picture of wholeness, restoration, victory over darkness and complete healing? But then is that really what wholeness, restoration, and healing look like? I don’t think so – its not about ‘erasing’ the scars is it? Because they will always be there. My scars will always be with me. As His were and are. But Jesus was not defined by them … He was not held back by them. They didn’t hold Him captive. A Pastor once told me if I was really a Christian then I would not remember my past. My childhood. It would all be erased. I’ve always known this guy was a misguided dickhead. But it hit me last weekend JUST HOW WRONG HE WAS. I am never going to ‘just forget’. But Jesus didn’t either? He didn’t ‘just forget’ his crucifixion. He didn’t just erase the pain. The wounds. Anyway, those were the two main themes for my thinking over Easter. And then Monday came, and I got thrown back into work, and prepping for a big interview I had on Thursday. I had little time to reflect much more on it. It was a crazy week. And then we got to the end of the week. I downed tools, finished work for the week, exhaled and went ‘aaah’. I was looking forwards to a weekend of writing, chilling, and church. And yet what I got, out of the blue that evening was a flashback. Not something I have very often but when I do it totally off centres me. If you don’t know what a flashback is, google it. I can’t adequately explain it here apart from saying that they are the most disturbing moments of life – when you are reliving a past event/trauma as if it actually happening again. And you are so totally in that moment that you can’t do anything to take yourself out of it. And when you come out of it, for me anyway, you are left with a real sense of what ever you have experienced in that flashback having JUST happened. So for me I come out of it feeling like I have just been re-violated. And it takes days and weeks to get back to some sort of sense of normality. They totally cut into life. The last one I had before this one was at the beginning of last Nov. In a church service. In the one place I was starting to feel safe in. And the mind does funny things to you, so not only did I come out of my flashback in church feeling a real sense of having been violated, my mind was also connecting what had happened in my flashback with where I was standing. Church. Connecting the two. I have to say that night was one of the darkest experiences in the whole flashback/nightmares/recovering from trauma stuff I’ve had. But I managed to move on from it, move forwards, and continue the crazy journey I seem to be on with God at the moment – with the help of some exceptional people who have been put in my path without whom I would have definitely derailed totally by now. So this weekend has been tough. I’ve felt shaky, mentally. Because it feels like I’ve been side swiped. For the Good Friday service I was asked to take part in the cardboard testimonies they were going to be doing. I was really apprehensive about this but oddly had been asked to participate in another cardboard testimony event happening at something I was at the week before. So I did. I created my cardboard testimony, and firstly did it, with others in a room of about 500 young people I didn’t know. And then, most importantly on the Friday night, in my church. The church I rocked up at almost 11 months ago now (!) and never left. The church that I rocked up at and proceeded to cry in every single service I attended for the first 9 months. The church I rocked up at and never made it through an entire service for the first 4/5 months. The church which I have made myself so incredibly vulnerable to, like never before, anywhere. Ever. And it was important to me to stand before ‘the church’ (well those at that service) and show them my story in brief words because until then just an incredibly small handful of people knew. Because people knowing, offline, face to face, people I see who are loving me and who I am starting to love back is different to writing online. I find writing, blogging, tweeting so much easier than looking into someones eyes and knowing they know who I am. My story. Where I’ve been. One day I hope to share it with them more fully. So it was important to hold up my cardboard testimony and tell them who I am. But also to tell them and to claim what is happening. What God has been doing over the last year. AND what He is continuing to do. Because God IS working in my life. I AM moving forwards. I am changing. Being changed. But its painful. And slow. As someone suggested today, maybe slower than I want? BUT I have to remember and hold on to the fact that what I held up last week is truth. And I’ve been really reminded of that today. Today, the day where I walked into church and then walked right back out again because it was too full and I burst in to tears before I even got sat down. I’m reminded of my cardboard testimony today, the day where when I finally did make it in to the church I had a panic attack because during the ‘meet and greet’ sesh which doesn’t happen every week I sat with my head down but a woman sat behind me who was visiting put her hands on my shoulders and told me God had given her a bible verse. A bible verse that is really important to me at the moment. One of the few that I’m clinging on to when it gets tough. One that, when she spoke it, broke me. But because I was feeling already nervy, jumpy and shaky, the fact that this woman I didn’t know had laid her hands on me sent me into full meltdown mode. Most of the time I can tolerate touch. I’m moving forwards with it. I don’t have such an issues with hugs, and greetings as I did before and actually there are some people, that I’m trusting that I’m totally fine with, but this morning was not a good day for anyone to try it. Full stop. Because I was so nervy anyway. Any other time I’d have been fine. just not today. 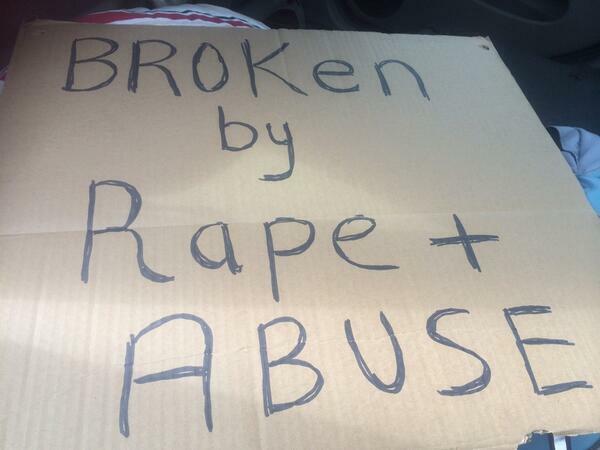 So, anyway, I’ve been reminded of my cardboard testimony, that I held up, just last week. And despite this weekend and how tough it has been I’m holding on to the words that I proclaimed by holding up the piece of card, stating my story but claiming what my rational mind knows is truth. 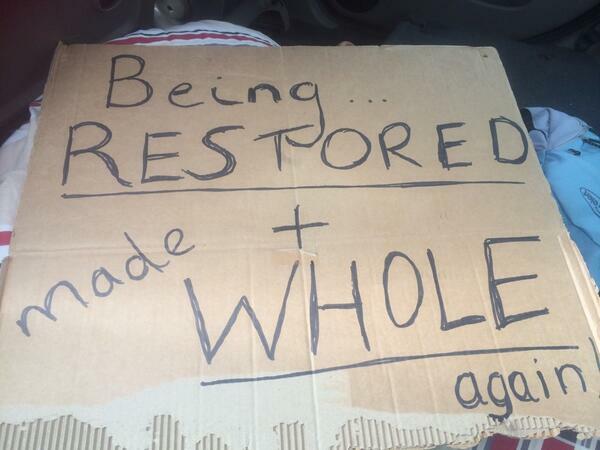 So this is is – my cardboard testimony – and being restored and made whole again is the journey I’m on.